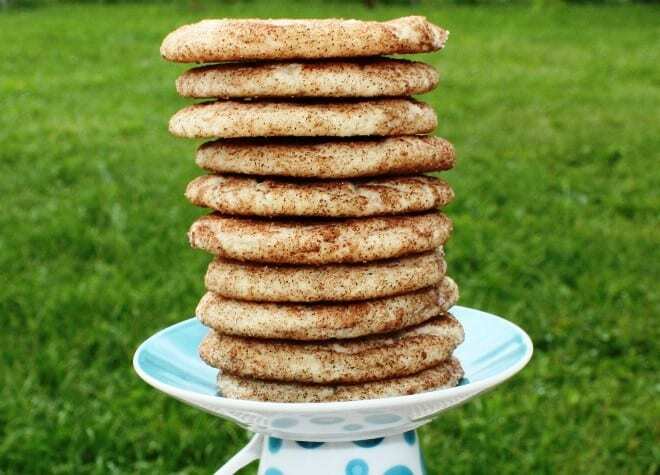 Home » Blog » What is a Snickerdoodle? To kick off Snickerdoodle week, I thought it’d be important to explain what exactly a Snickerdoodle is! Well, my friends, a snickerdoodle is a delicious cookie that has been rolled in cinnamon and sugar. Similar to a sugar cookie, but just a little bit different. You see, a snickerdoodle is made with a white powder called “cream of tartar” which activates the baking powder during the baking process. Personally, I think it gives is a bit of a twist in the flavor too. Also… a snickerdoodle is different than a sugar cookie in that it is rolled in sugar AND cinnamon. DIVINE ! Where does the name Snickerdoodle come from? The Joy of Cooking* claims that snickerdoodles are probably German in origin, and that the name is a deviation of the German word Schneckennudeln (lit. “snail noodles”), a kind of pastry. I’ve also read that some people think that it was just a made up word. Personally, I’m going to believe it has German origin, since I’m here in Germany! Typically, snickerdoodles bake relatively flat, chewy and super full of flavor. I’ve seen some doodles cook up puffy and with a mound on top, but I don’t usually like those. My favorite is fresh from the oven and soft. After a couple days though, these cookies tend to get a little crisp and hard, but nothing a little milk and dunking can’t fix! Check back everyday for a new way to make these delicious little cookies!